Heavy-Duty Lock Boxes have been used and trusted by real estate agents for years. Now they are available at down-to-earth prices for the property preservation contractor. 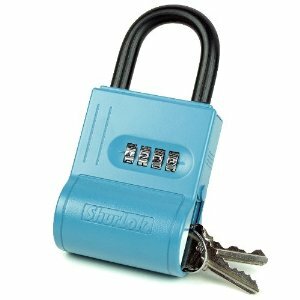 These heavy duty lockboxes are easy to use with re-settable combinations that can be changed in seconds without tools or disassembly. Shackle conveniently hangs on door knob, railing or fence and releases from inside the box. Faceplate attached to the box with a removable chain to prevent loss or accidental resetting of the faceplate. Lockboxes come preset to OCN/0000.